We provide only high reliable solutions for reach trucks because of the increased axis to extend the fork out, we trust you’ll want the best in safety and reliability when it comes to reach trucks. You might recognise a reach truck like how some would describe it as a stacker with scissors extending forks. However, technically that could also be a double deep reach truck. Regardless of the type of reach trucks or stackers you require, we will have a solution for you. Local warranty and support for low operational downtime! Local warranty and support for low operational downtimes! 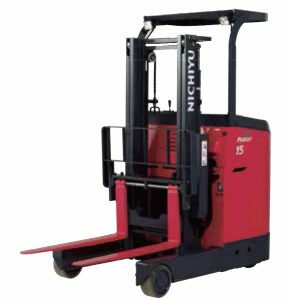 We do have reach trucks from other brands besides the usual Toyotas such as the Nichiyu Reach Trucks. Drop us a line to find out more. All reach trucks have a limit they can lift. A 1.5T capacity reach truck will not lift 1.5T of goods to the maximum height. 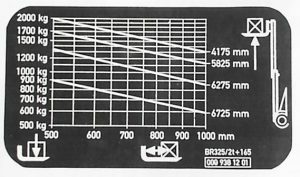 All of them have this load capacity chart that looks like this. A reach truck can easily reach 2T unloaded because they need to be heavy for stability when reaching out without toppling over. When fully loaded with goods at maximum capacity your reach truck can weigh in close to 5T! If your reach truck needs to go through doors, make sure that the door is high enough to let the reach truck through with it’s mast fully lowered. Even though these reach trucks are design for the narrow aisle operation, it still requires some working space. 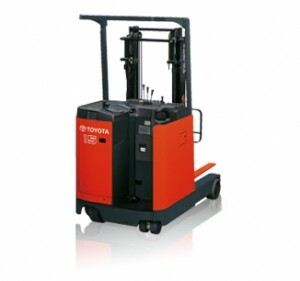 As these type of reach truck is very specialised, they require a stringent environment to work in. Check with us what fits your type of operation. Our reach trucks are supported by qualified technicians that uses original parts to ensure the long working life and serviceability of your equipment. Any Pre-Loved (aka “Second Hand”) Reach Trucks? 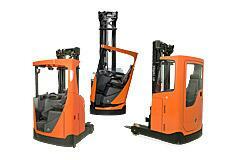 Once in a while we do have customers who are upgrading to forklifts and want to sell their existing reach trucks. Give us a tinker and we’ll check it out for you. Even our used trucks are serviced and reconditioned to make them look almost new. Yes we do have bigger models of reach trucks available. Just drop us a call or email and we’ll advise you accordingly. Have an old reach truck to sell? Drop us an email with the description of the reach truck, some photos of the exterior of the reach truck as well as the silver information plate. We buy in used reach trucks of any age.